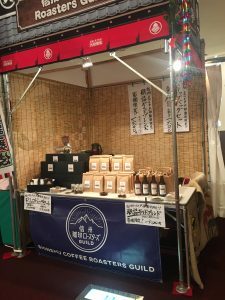 While we were participating Matsumoto Kabuki as a part of Shinsyu Coffee Roasters Guild, we have met so many nice people. We also felt sorry for those who showed up but the café was closed or food menu was very limited. Now we are back on the normal schedule with a good selection of craft beers to quench your thirst or good jolt of coffeine with our nitro coffee. It was a nice surprise to find that so many people have shown some interest to what we were doing as the Guild. Basically we are trying to tell people that difference is fun. For instance, we split a sack of green beans with the members, and we roast according to what we believe. The outcome is probably more than you would expect. Some of us loves dark roast, while some of us roast very light to bring out what the beans used to have when they were a fruit. Every roaster has their own protocol, and their roasters are different. The heat source of my roaster is inductive heat coil while others use gas. The size of roaster also matters to the taste. So, the green beans from the same sack will become very different coffee. This is a very unique challenge of the Guild which I have never heard of such a program in other cities. We were selling “the bottled coffee beans: the Kabuki special blend” at Kabuki but they were gone very quickly. The blend is just for Kabuki but the bottled coffee is our regular item. It is unique and lasts very long time. It is an ideal gift while you are on the run and do not know when you can give this gift to your coffee loving friend. Our bottled coffee is a very unique package for coffee but it works to preserve the freshness of the beans in several ways. Coffee beans exhale a lot of CO2 from the moment right after the roast. 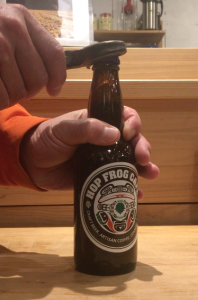 Once they are packed in a bottle, the CO2 builds up pressure inside of the bottle. The rate of CO2 discharge would get slowed down as the inside pressure of the bottle gets higher, and eventually they get equilibrium. This is an ideal environment for beans since they are covered with inert gas which is CO2, and the pressure restricts further discharge of CO2 and other aromatic properties.